She is author of the critically acclaimed book Post Black: How a New Generation is Redefining African American Identity and 2212: Book of Rayla. She is also the co-editor of the hip hop anthology Beats, Rhyme & Life: What We Love and Hate About Hip Hop. Monkeybicycle: Your most recent book is about Afrofuturism. What is Afrofuturism and why does it matter? Ytasha L. Womack: Afrofuturism: The World of Black Sci Fi & Fantasy Culture explores the intersection between technology, black culture, the imagination and liberation. It is a way to view probable futures through a black cultural lens. Afrofuturism differs from general science fiction because it can be used as critical theory to explore otherness and the subconscious. As a storytelling device, Afrofuturism involves a great deal of mysticism, too. Afrofuturism matters because it empowers people to use the imagination to transcend boundaries or shift their worldviews and because it challenges conventional ideas around time and who shapes the future. I don’t ride the storm, I am the storm. But the thunder is caught in my throat. Mb: The Book of Rayla is a story of the distant future as well as time travel, but in a way that I think is rarely explored. Where did your ideas of time travel come from for this novel? YLW: Before 2212: Book of Rayla I wrote a book called Post Black: How a New Generation is Redefining African American Identity. Post Black looks at 21st century black identity in evolving times. In essence, Rayla is my fictional exploration of identity in a time when race as we know it does not exist, yet the character is informed by a host of present day and ancient cultures and as she navigates through times and lifetimes, she explores another level of the “Who am I?” question. For me, it was a fun way to write because Rayla lives on a former space colony turned independent settlement on a planet 200 years into the future. I can’t exactly use current day cultural dynamics to write about her and yet, she quotes hip hop and pop song lyrics like we quote Shakespeare. Mb: You’ve written for a variety of mediums. How is writing for film and books different? Which do you prefer, and which is more rewarding? YLW: The medium dictates a different approach to telling the story. In film, you write what the audience sees and hears. The script is a framework for a story where the final product is watched on a screen, not read. The visuals and dialogue hint at a larger story. In a book a scribe can write a character’s internal dialogue and be less concerned with physically describing a character’s location or relying on action. Books are more about writing how a character feels and about what the character is thinking as he or she travels through a world. In a film, the character has to be doing something that audiences can physically see. Both are equally rewarding, it just depends on how a writer wants to tell a story and what’s the best medium to do so. But if a writer wants to have more oversight, then unless they are producing the film, they may prefer to write a book. Planet Hope was built on the principle of universal love and cooperation. As achievements were made, Earth used these strategies to improve their own world. We high-kicked them out of the Information Age and into the Age of Intuits. We are credited with establishing the New Earth. Flying machines and vehicles that run on air-compression systems, solar-powered energy rings that powered everything from heating systems to home appliances, and a host of eco-friendly power sources emerged. We uncovered the ‘fountain of youth,’ a lifestyle and herbs that prevented aging. We cured all disease. Our technological advances were only rivaled by our models for human life. 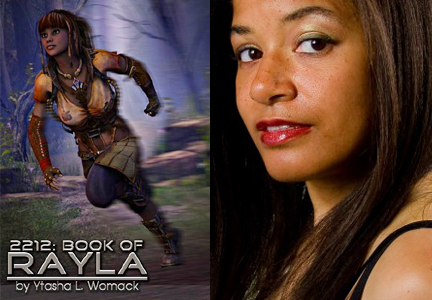 Mb: With The Book of Rayla you did more than simply write the novel. You turned it into a multimedia experience, including making Rayla her own Twitter account. Why did you choose to present the character in this way, rather than solely in the novel? YLW: I wanted to explore digital media as a storytelling device. In the past, independent creators were limited by their resources. However, digital media enables creators to connect with audiences in a variety of ways, including social media. Readers can listen to music that Rayla listens too, they can follow her thoughts and ideas, they can see a host of images by various creators that reflect her world, or they can read about real world issues that impact the creation of her world. For me it was a fun experience and readers seemed to like it, too. Mb: What’s next for Rayla and are there any plans to push the project further across mediums? YLP: I debut new art work from Rayla’s planet at the Race in Space Conference at Duke University on October 26th. The art was created by Craig and Cory Stevenson. Viewers can see the origins of Planet Hope through art commissioned by one of the planet’s griots, Ice Ostara, who by the way, is the image on the Afrofuturism book cover (by John Jennings). Rayla’s saga will be released soon, too. In lieu of that there are a few stories that will be released as well. And I have have some more cool stuff in the works. Rayla is in flight. Read more from / about Ytasha L. Womack here. Buy a copy of 2212: The Book of Rayla here.